Online master’s degrees have helped millions of working professionals advance their careers. The Online Degree Database is the only independent and comprehensive source of information about online master’s degree programs available in the market today. We are not a market aggregator or lead generation website. We have created a database which contains the program details of all the most popular online master’s degree programs in the U.S. and made it available to you to assist you in your search for the right degree to advance your career. Over the next year, the scope of the online programs covered in our database will expand to include online bachelor’s degrees, associate degrees, and online certificates. The data in the Online Degree Database is collected from university websites by highly-trained individuals who capture program details through a uniform process in a relational database. Data on universities from other sources, including the National Center for Education Statistics (IPEDS) and U.S. News & World Report rankings are also included. This allows for a robust, comparative view of programs for prospective students and other interested parties. So let our education experts get the search for your career graduate level education started in the right way to keep your career advancing according to your own life goals. If you need to work while pursuing your bachelor’s or graduate degree, online degree programs let you to keep your job and take classes around your work schedule. Even better, learning online lets you earn your degree from a university that is more prestigious nationally or has exactly the faculty, accreditation, courses, concentrations, or cost you want –but can’t get — locally. If you are searching for online master’s degree programs like the MBA or MAcc or MSW, you face a huge challenge. 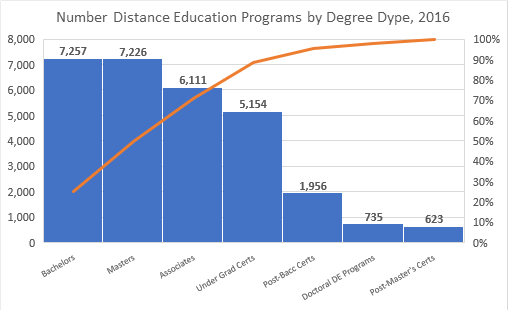 According to the U.S. Department of Education, the number of online master’s programs grew by 89% in the last five years, from 3,826 programs in 2012 to 7,226 programs in 2016. These data are always behind by 18 months, so it is safe to assume that there are more programs now! In the Business category alone, the number of online master’s programs grew from 770 in 2012 to 1,536 in 2016. More discreet details on the types of institutions offering distance education programs (2-year vs. 4-year, private vs. public, for-profit vs. not-for-profit, etc) can be found here. There are only eight Master of Economics programs online today. Searching for these programs and reviewing the program details would take only a few hours of your time. But, there are 491 online Master of Business Administration programs, 87 online Master of Accounting programs, 113 online Master of Criminal Justice programs, 102 online Master of Public Administration programs, and 105 online Master of Social Work programs today. Searching every available online program to find the right one for you is just not practical or even possible for most people. The Online Degree Database is a complete source of online degree information that you can use for your research. Make sure that this investment of time and money is spent wisely. Our data includes online degree programs that are advertising in the market now, in 2018. We have the most up-to-date and accurate information available in the market today. You can find out exactly how many online master’s degrees are available in the market today using our Interactive Tool, especially among those degrees (MBA, MPA, MSW, and more) that are most popular. At each step in the process, the Interactive Tool tells you the number of programs that meet your criteria so that you can see exactly how many programs meet your needs. At absolutely NO COST – every search is free! Maximizing your flexibility and choice is exactly what the Online Degree Database’s Interactive Tool is designed to do. Unlike other websites that claim to guide you to the best programs, this website gives you the tools you need to make your own decision using the universe of available options to get your started.